As people created to love and worship God, and to follow the example Jesus gave us, we can recognize the deep waters or storms that we go through as opportunities to find our true selves. It’s been a full month. I spent a week in Michigan playing golf with pastor friends (richly enlivening my soul) and three days in Washington, D.C. on a field trip with Peter. In the midst of that travel and other days off from school that one or the other of our boys have had, I haven’t been spending as many hours in my “office” here at Starbucks. And I haven’t found or made time to write another blog post. But because my friend Tim’s life is also full, we’re not on the golf course today, and I find myself with extra time and plentiful coffee. So I wanted to think back and share some reflections about our worship in September based on the Season of Creation. 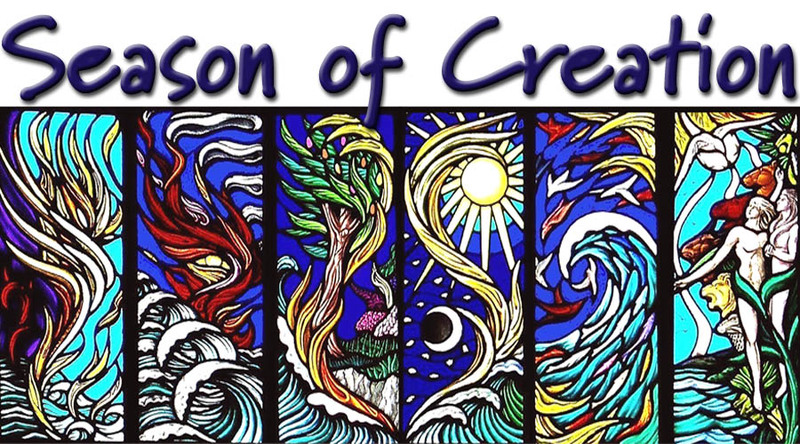 The Season of Creation is a lectionary and liturgy developed in Australia to celebrate God’s role as creator, and our role as stewards and partners within creation. This year for the first time, AMF structured our worship throughout September on the texts and resources of the Season of Creation. We had beautiful visuals each week and sang hymns focused on creation. Most interesting to me, each of our sermons (none of which I preached) invited us to reflect on our relationship to God in new ways that have me still pondering them. On the first Sunday of September, David preached on “Flora and Fauna Sunday.” What has stayed with me was his suggestion that we should attempt to adopt a Psalm 104 theology - a recognition that we are part of creation, having a symbiotic place within the created order. 20 You make darkness, and it is night, when all the animals of the forest come creeping out. 22 When the sun rises, they withdraw and lie down in their dens. 23 People go out to their work and to their labor until the evening. I found myself wondering about this. Can we understand ourselves in this way? Or have we dominated the earth to such an extent that this is no longer possible? Can we see ourselves as partners with the rest of God’s creation? Or is our best hope that we can manage our environment so that flora and fauna will be preserved in pockets of wilderness for our enjoyment? I fear that the latter is true. Scientists have recommended that we recognize that we have entered a new geological epoch (the Anthropocene Epoch) characterized by human impact on the earth. And I fear that our knowledge of the interrelationships of the ecosystems we inhabit is insufficient to manage them well. On the second Sunday, a guest preacher, Paul Wallace, spoke on “Cosmos Sunday.” Paul has authored The Stars beneath Us: Finding God in the Evolving Cosmos, which uses the book of Job to issue a “call to courage for those who fear a true encounter with the cosmos will distance them from God.” Reflecting on the sense of awe to which Job is brought as God reveals creation to him, Paul suggested that it is in looking beyond the earth which we have “tamed” to the unfathomable depths of the cosmos that we might find a similar sense of wonder. Just as God asks Job who brings rain to the desert that grass might grow where no human treads (Job 38:25-27), we might wonder about God’s provision for the vast myriad of universes beyond our ken. I wonder if Paul’s point might supplement David’s, if in considering the smallness of our planet in the midst of the cosmos, we might be brought to the humility that Job and Psalm 104 encourage. In consideration of the cosmos if not of our small earth, might we recognize that we are not equipped to master creation, and offer ourselves to God and God’s creation as creatures and partners, rather than gods over our domain? The final Sunday of September, Lydia preached her first sermon (which was great) on “Storm Sunday” and invited us to sometimes pray that we might ride out the storm, rather than that God might remove it. Reflecting on the disciples in the middle of the lake after Jesus calmed the storm (Luke 8), she wondered what they thought of then having to row a becalmed boat to shore. These two reflections also seem to me to invite us not always to seek to control our surroundings, but to trust God’s accompaniment and provision in the circumstances in which we find ourselves. As people created to love and worship God, and to follow the example Jesus gave us, we can recognize the deep waters or storms that we go through as opportunities to find our true selves. We can recognize our dependence on God for that which is deepest and most precious within us. Such humility and recognition of God’s grace should affect both our relationships with each other, and with all of creation. Those are themes that I have affirmed for a long time. But I heard them anew through the lens of reflecting on God’s relationship to creation. Thanks to David for encouraging us to try this, and thanks be to God for creating this wondrous world around us. Within it, may we humbly serve God, serve one another, and serve our fellow creatures.